Number 34: "Alexa, get rules for board games"
Amazon’s Echo speakers that come with the power of Alexa, have really changed the way people interact with devices at home. Personally, Alexa is the only device that my kids interact with on a regular basis. Siri was exciting for a few days for them, but just didn’t work well often enough. While Siri has stagnated, Google and Amazon have really built devices and services that you can talk too to get information, play games, etc. and use to perform tasks like control your smart devices or order a pizza. Not only that, but Alexa is incorporated into a bunch of different devices beyond those created by just Amazon. You can use Alexa on your TV, thermostat, in your car and even in some headphones. And since the service runs in the cloud, it constantly gets smarter and there is no need to upgrade your hardware. In this article, we’ll take a look at some of the most useful commands and skills that you can use with your Echo device and Alexa. Note that you can enable any Alexa skill by simply saying “Alexa, enable the NameOfSkill skill”. If you’re not sure what you can ask Alexa, just say “Alexa, what things can I try?” and she’ll start telling you different commands you can speak. If you want to know what kinds of skills Alexa has that you can enable without having to look them up online, just ask “Alexa, what are your most popular skills?“. If you want specific skills, you can ask about those too. For example, you can ask “Alexa, what are you games skills?” or “Alexa, what are your smart home skills?“, etc. Like a good assistant, Alexa is on top of your java requests. The Behmor Connected Brewer is controlled by using your voice, a compatible smart switch and a very basic drip coffee brewer. It also integrates with Amazon’s Dash buttons. As a result, this feature automatically reorders coffee when it starts to get low. This Day in History is a skill that’s sponsored by The History Channel. It shares historical facts from the day with the user. Just say, “Ask this day in history what happened on March 10.” They also have a This Day in History Top Story, which is also a popular skill. 51. Can You Say That Again? Reconfirm what was said by saying, “Alexa, can you repeat that?” or, “Alexa, can you say that again?” This high-tech personal assistant repeats what she said as many times as a user needs. Interested in looking up recent responses? Then check out the Home tab of the Alexa app. The user can also listen to the recordings of all the things that have been said to Alexa to-date. 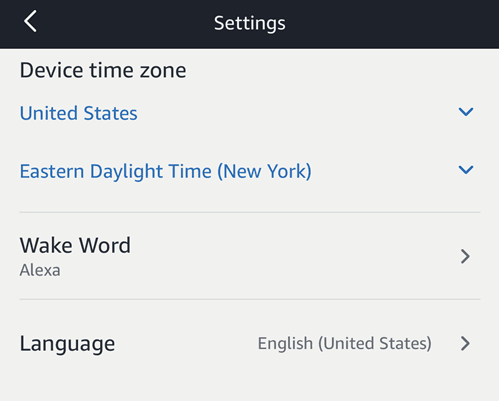 Changing the wake word from Alexa to another name is an option. However, it must be a name that’s included among the choices. Choose from amongst Alexa, Amazon, Computer or Echo. First, pick a name from among the choices given. Then open the Alexa app or go to alexa.amazon.com. Next, open Settings, choose an Echo device, tap on Wake Word, select a name from the drop-down menu, and tap Save. Consumers that are active at work when they’re on-the-go will find the Chat Bot Skill pivotal to increasing productivity. By enabling the ChatBot skill, workers can audibly request Alexa to post on their behalf. If the user has a Capital One card, then checking their balance is hands-free. Just by saying “Alexa, open Capital One,” a consumer is able to check their account details: from checking your current balance to viewing available credit and cash on hand to seeing credit card due dates and recent transactions. 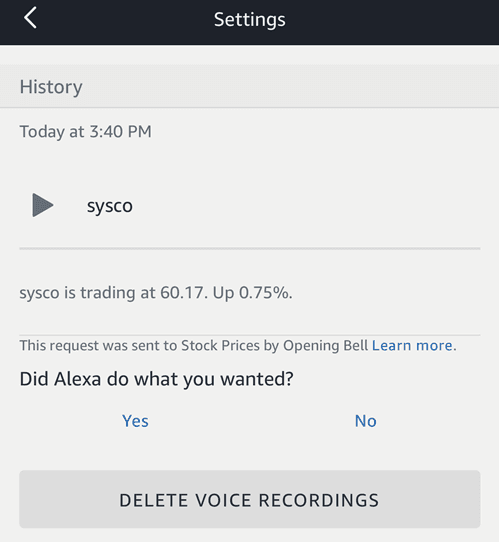 Just by saying, “Alexa, ask Opening Bell,” a consumer is able to check the stock market. Furthermore, ask Alexa for the price of a stock using the company’s name instead of its symbol. By and large, the data from this service is provided by Market On Demand. Additionally, TD Ameritrade offers a similar skill. Enable the cleaning function along with the Neato Botvac Connected, the iRobot Roomba 690, 890, and 960, or the Samsung PowerBot VR7000 series. In this way, cleaning becomes handsfree. By saying “Alexa, start cleaning,” the high-tech assistant communicates with the wireless vacuum. As a result, the vacuum immediately goes to work cleaning the apartment or house. The Fitbit skill lets a consumer ask, “Alexa how many steps have I taken?” or “How well did I sleep?“. Users can also check how they did on other metrics recorded by their Fitbit activity tracker. Alexa is a savvy trainer too that is ready to talk the consumer through their workout. Smart thermostats like the Nest Learning Thermostat, Honeywell Lyric, and Ecobee are connectable to Alexa. Thanks to which, changing temperatures is simpler than ever. Specifically, Ecobee4 has Alexa built into it. Setting up voice profiles enables Alexa to distinguish who is issuing the command. As a result, it provides personalized results. By listening to a particular voice and asking, “Alexa, what’s on my calendar?” Alexa replies with upcoming events from the voice profile’s calendar. Then if another voice asks “Alexa play music“, it will then select music based on their voice profile’s personal preferences. Read about how to create a voice profile here. There are strings of commands which encompass particular times of the day. For instance, the user can create a routine for the phrase Good Morning. A string of commands could be linked together into a routine. Therein, when the user wakes up and says “Good morning,” the routine turns on the lights, start the coffee maker, speaks the morning weather, and starts the car to warm it up. Currently, they only work for smart home devices, news, traffic and weather updates. 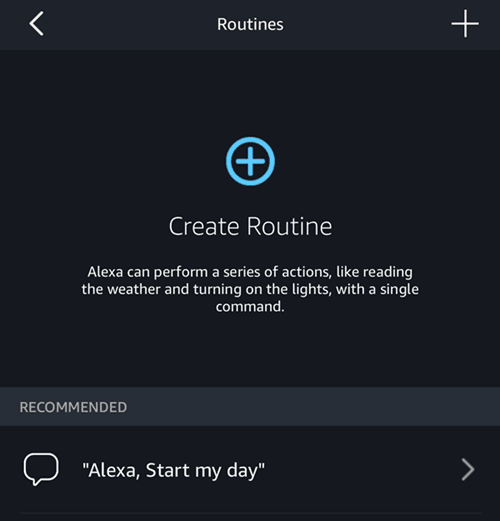 To create a routine, open the Alexa app, go to Settings, then tap on Routines. Overall, everything that is said to Alexa is recorded and uploaded to Amazon’s servers. 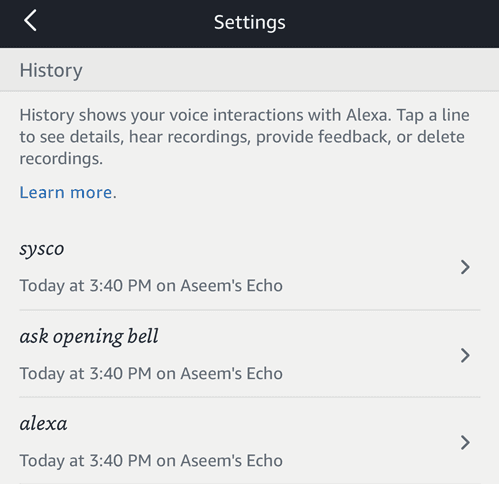 Delete specific recordings, by going to the Amazon Echo app > Settings > History. A list of everything recorded appears. To delete a recording from that list, tap it, then tap Delete voice recordings. By asking, “Alexa, what are your deals?” a consumer can review a series of Amazon Prime member-exclusive deals. You’ll need an Alexa-enabled device to order. Additionally, visiting Amazon’s Voice Shopping page briefs the consumer of the appropriate sentences to say to trigger purchases or add items to your cart. The Red Planet poses plenty of questions while igniting a curiosity and the NASA Mars skill keeps users abreast with the goings-on of the Curiosity rover. It also delivers answers to commonly asked questions about the Red Planet. There are also a couple of other great skills too like NASA Breaking News, NASA News and Daily Dose of Space and Space Facts. Love listening to music? Well, why not test out how good you are at identifying songs and artists by playing the Song Quiz skill. It plays music from every decade starting from the 60’s. You can also play against someone else for true competition. Providing basic first aid answers, The Mayo Clinic released a skill checklist for first-aid from minor scratches to CPR. For instructional purposes only, this function briefs the user on vital life-saving techniques. It’s not to be used in a life-threatening or emergency situation though. In that case, it’s best to call 911. Tell your loved ones and significant others that you need help. While this is no substitute for 911, it is a service that quickly connects to your support system. When you can’t reach your phone, the Ask My Buddy skill sends an emergency notification by text, SMS or phone call to a preselected person. Another good one is SafeTrek. The Board Game Answers skill lets Alexa remind the user of the directions for popular games. If further clarification is needed during a game, then call out, “Alexa, ask Board Games who goes first in Monopoly.” Enabling the Board Game Answers command, Alexa becomes an on-hand digital referee that’s all ears. The Campbell’s Kitchen skill and command is by far the most popular function to find recipes, along with the AllRecipes skill. Five recipes are featured daily on the Campbell’s Kitchen skill. Most importantly, after selecting a recipe, the ingredients and directions are sent to the user’s Alexa app. A 5-minute briefing of the day’s headlines, which is updated every hour, is available on The NPR News Now skill. Likewise, CNN, the Associated Press, and the BBC offer similar skill functions as well. With Alexa, a consumer has immediate assistance in finding their phone using their voice. According to the reviews, the phone will ring even if it is on silent. It may not work, though, if your phone is in Do Not Disturb mode. You can also add multiple people by name to call different phones instead of just one. Daily Zodiac readings are available in several different apps. The Elle magazine’s Astro Twins skill provides one of the most popular horoscope readings. Once the skill is enabled, the user is able to receive personalized horoscopes from the Astro Twins. These identical twin sisters provide daily readings. Other good skills for horoscopes are Daily Taro Reading and Astral Nina Daily Horoscope. Receive insight and motivation from the Inspire Me skill. Serving inspirational quotes from famous people, from Maya Angelou to Christopher Walken, users are never at a loss for wise words. Uniquely, the quotes are spoken by the individuals themselves rather than via Alexa, which enriches the experience. Stream thousands of podcasts with the Anypod skill. It’s possible to search by name, subscribe to podcasts, skip ahead or back, and pause an episode. When a user pauses an episode, it’ll pick up right where they left off. The Anypod skill offers a magnificent 3000-plus library of podcasts. With such podcasts like Serial, RadioLab, This American Life, S-Town, The Moth, The Daily, TED Radio Hour, and This Week In Tech. It’s possible to make voice or video calls to and from other Alexa-enabled devices. Compatible devices, for example, include the Echo, Echo Dot, Echo Show, as well as the Alexa app on the user’s smartphone. In detail, Alexa pilfers your address book to find compatible devices, and then it offers the option of calling or texting them. Just say “Alexa, make a call” or “Alexa, send a message“. To check which profile is being used, ask, “Alexa, which profile is this?” To switch between profiles, say, “Alexa, switch profiles.” Multiple people and their respective Amazon accounts can be added to an Alexa household profile. It’s important to realize that additional members doesn’t mean there are separate shopping or to-do lists. However, it does allow the ability to share content libraries. It’s also worth noting that this command allows those additional members permission to use the primary Prime account to order items. Get aligned with your breath and clear your mind with Stop, Breathe & Think, Meditation Timer. This function starts off by asking how long you want to meditate for. It also plays the sounds of forest, rain, or surf to relax. Drink connoisseurs will enjoy the Bartender skill. This command gives the user access to more than 12,000 different cocktail recipes. Plus, by asking “Alexa surprise me with a randomly selected drink“, the user will receive a sporadic drink suggestion. Just by asking, a consumer can order millions of products from Amazon prime through Alexa. Order anything that is Prime-eligible. What is not included in this function is the ability to buy apparel, jewelry, shoes, watches, Amazon Fresh, Amazon Prime Pantry, Amazon Prime Now or add-on items. Once a consumer has set up an account with Uber or Lyft and the payment options are fulfilled, they can request a driver from Alexa. By saying, “Alexa, ask Lyft to request a ride” a consumer is nearly ready-to-go. While your wish is Alexa’s command, the ride fare is debited automatically from your account. By setting up an Easy Order and enabling the Domino’s Pizza skill, the consumer can order pizza effortlessly. By saying “Alexa, open Domino’s and place my Easy Order,” the pizza is ordered. Furthermore, the consumer can check the status of their order on the Domino’s Tracker updates. Pizza Hut also has an Alexa skill if you want to order from there. Simply saying, “Alexa, tell 1-800-Flowers to send flowers to Mom,” the user is able to expeditiously send a Mother’s Day gift. First off, a 1-800-Flowers account is required to enable this skill. Once the consumer is connected, they can easily order a bouquet. To be noted, the user needs to tell the company the addresses for the contacts, the arrangement style, and the preferred size. On the whole, payment info needs to be entered ahead of an order. Training gets a whole lot easier when the user asks, “Alexa, start the 7-minute workout.” This function suggests reportedly tested exercises that’ll increase metabolism, improve energy and reduce fat. For the consumer who needs to make the most of their time, Alexa’s Personal Trainer function is a great tool. Using Amazon’s music library, the consumer is able to launch playlists. These playlists are based on specific activities, eras, artists, and even your mood. 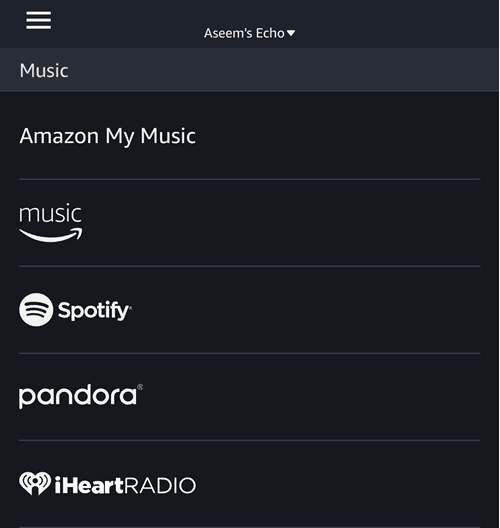 Stream music using Alexa from a variety of services like Spotify, Amazon Prime Music, iHeartRadio, TuneIn, Pandora, and SiriusXM. The best-known command of Alexa is to play music which can be done by asking, “Alexa, play Classical Music.” Yet it’s also possible to stream the music. For this, Prime Music or Amazon Music Unlimited is needed. If the user has Amazon Music Unlimited, then they’ll also need to go ahead and subscribe to the Family Plan. Then by going to Multi-Room Music section in the Settings menu on the Alexa app, users can follow the directions. After which, they will be able to easily stream the music of their selection throughout the home. By asking “Alexa, play Trivia games,” a user transforms into a player. Other games are available like Rock, Paper, Scissors, Lizard, Spock, Chess, 20 questions, Bingo, Jeopardy, and Tic-Tac-Toe. To learn more about the game selection, check out the Games, Trivia & Accessories webpage from Amazon. Another popular game that is an Alexa skill is Yes Sire, where you are the lord of a realm and have to make many decisions. New moms will love the Everyday Health’s What to Expect skill for Alexa. In essence, it provides daily and weekly tips, guides, and advice for expectant parents. Moreover, it’s customized to the due date of the pregnancy. In the long run, it’s capable of providing advice for the first year of your newborn’s life, too. 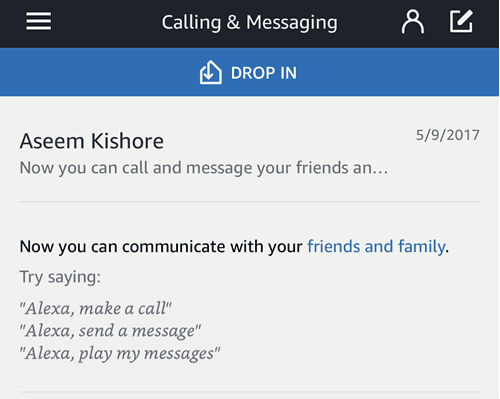 Any contact of yours who also owns an Echo, Echo Dot or Echo Show and has enabled calling is displayed in the Alexa contacts list. Send a message by saying, “Alexa, send [name] a message.” The message will send to the respective Echo device and Alexa app on the recipient’s phone. Start your car and warm it up before you get inside. Select Hyundai autos with the Blue Link feature can be started remotely. Moreover, one can lock and unlock the doors. The driver can change the interior temperature and turn on the horn and lights, by using the Blue Link Skill. Mercedes, BMW, and Ford vehicles offer similar skills too. The most used function on most Echo devices is playing some kind of music or sounds. If you have trouble sleeping, one of the most popular skills of all time on the Echo is Zen Sounds: Healing Sounds. The audio is of high quality and consists of 1 hour streams rather than short little audio clips. Another one of my favorites is Ambient Sounds, which consists of thunderstorms, rain, ocean, bubbling brooks, and lots more. Just by saying “Alexa, tell a bedtime story to [child’s name]” parents have an instantaneous storyteller at beck and call. Alexa is capable of helping with story time. Moreover, the Bedtime Story skill is ultimately personalized to the child’s preference. Enable the Guitar Tuner skill to use Alexa like a pitch pipe and tune strings on a guitar. Ultimately, Alexa plays a tune and the user has to tune their strings until its sound matches the note played. This is a clever musical tool. By saying, “Alexa turn off my connected lights,” the user is able to turn off the lights without moving. A key point to remember is that the consumer needs a connected device like a WeMo smart plug for this skill to work. Other companies like Lutron, Samsung SmartThings, Philips Hue and Control4 offer similar skills for turning off the lights too. Track an Amazon purchase by asking, “Alexa, where’s my package?” or stating, “Alexa, track my order.” Although details are not included, it will tell the consumer the expected arrival date of their delivery. Utilize this intercom option to pipe into Echo speakers that are placed within a house. Providing a direct line of communication to the Echo devices around the house, messages are relayed quickly. Say, “Alexa, drop in on the living room,” then whatever is said will be played through the Echo speaker in the living room. By connecting Alexa to a Logitech Harmony remote, voice-activated commands eliminate the need to push buttons. By saying, “Alexa, turn on my TV” or “Alexa, pause,” the command is automatically sent and received. Additionally, Dish customers are quite capable of controlling their satellite TV box using Alexa as well. Learn something new every day with the Word Of The Day skill. On the whole, increasing vocabulary is more interesting with the Word Of The Day function. This smart command shares the definition of the word and it also uses the word in a sentence. Whew! That’s a lot of commands and skills! I’m sure this list will be out of date within a year, so I’ll be sure to come back and update it with new features and skills that Alexa will gain. Enjoy!